Minas Tirith - Whereas Minas Ithil was built on the east end of Gonder to guard against Mordor, Minas Anor was built on the west end to guard against the Easterlings and other Men who were allied with Sauron. But when Mordor captured Minas Ithil and invaded Gondor, the people abandoned Osgiliath and retreated to Minas Anor. 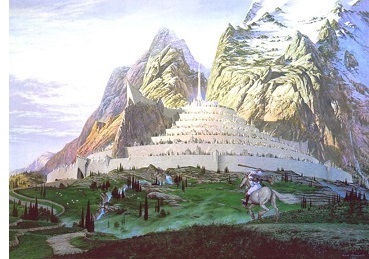 It became known as the White City and was the glory of Gondor.